This is a nice Torbernite sample, producing a respectable 10,000 CPM of radiation. Most Torbernite samples contain a larger amount of crystals - making them far more expensive. This is a beautiful sample that is very affordable. The emerald green Torbernite crystals appear to 'twinkle' when rotated in bright light. A fine addition to any collection. 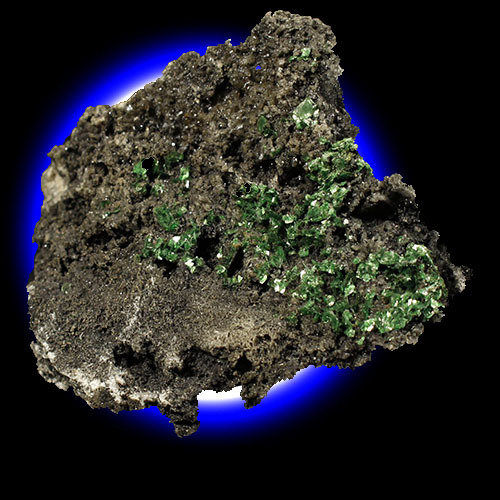 Torbernite is too rare to use for Uranium extraction experiments, but it is ideal for display or educational use. Please Note - all our Uranium Ore Samples are unique - that is, there is only one of each. As soon as it it sold, it is gone - and we have no guarantee that we will be able to restock a similar mineral sample. Uranium ore will measure up to 10 times higher on 'pancake' style radiation detectors. From northern Grants, New Mexico. As with all our Uranium ore samples, a certificate stating your sample's precise radiation measurement & associated information is included with your purchase. Click Here for more info. as they produce a deceivingly high reading.